Poorest teens have hardest time finding summer jobs. Summer employment provides teens with a valuable introduction to the world of work. But teens are seeing fewer job opportunities these days, and those who need work the most are the least likely to find it. The chart shows the employment rate for 16- to 19-year-olds who are not enrolled in school. 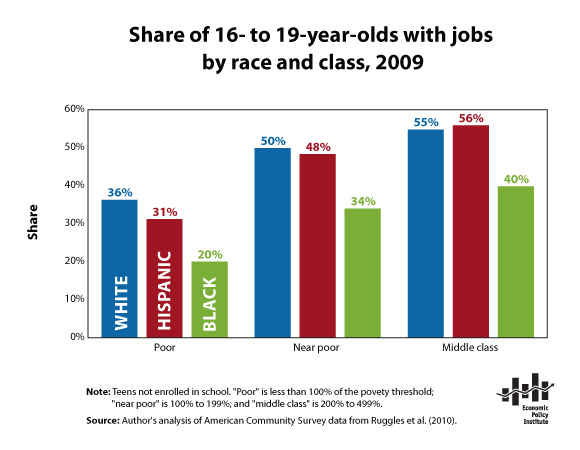 In 2009, teens from poor families were less likely to find work than their middle-class peers. Poor African American teens, however, were the worst off: Only 20% were able to find work, compared with 31% of poor Hispanic teens and 36% of poor white teens. In fact, middle-class African American teens were only slightly more likely to find work than poor white teens. From their first step into the labor market, all black youth—including the children of the black middle class—encounter difficulties in finding work.